Racing Beat's introduction to the Mazda Protege began with a request by Mazda USA to assist with the development of the 2001 Protege MP3. After this project was completed and these vehicles began appearing in Mazda's showrooms, we began offering performance products for Mazda's newest sports sedan. Our performance parts offering for the Protege was later expanded to include the popular Protege5, we invite you to review our online parts selection and contact with your technical questions. Parent company Centric has recently changed the name of the Power Slot brake component line to the more familiar StopTech brand name. These are the same components, just packaged and marketed under the StopTech name. We offer an extensive line of the most popular StopTech Mazda applications in both slotted and drilled/slotted rotor configurations. Looking for an OE replacement for your stock Protege shocks? 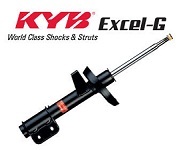 KYB Excel-G shocks for the Protege are designed to replace those old, tired original shocks and restore the ride quality to original comfort levels. The Excel-G shocks offer the Protege owner an outstanding combination ofÂ value, performance and longevity! Visit the Shock product listing in the product menu for more information. Read the official press release from Mazda regarding the Mazdaspeed Protege project. Follow along as we work with Mazda R&D on the development of the 2001 MP3 Protege project. Easy to install, great performance! Lowering springs for either the sedan or Protege5. Cat-back emissions legal. Easy to install bolt-on design - awesome sound!